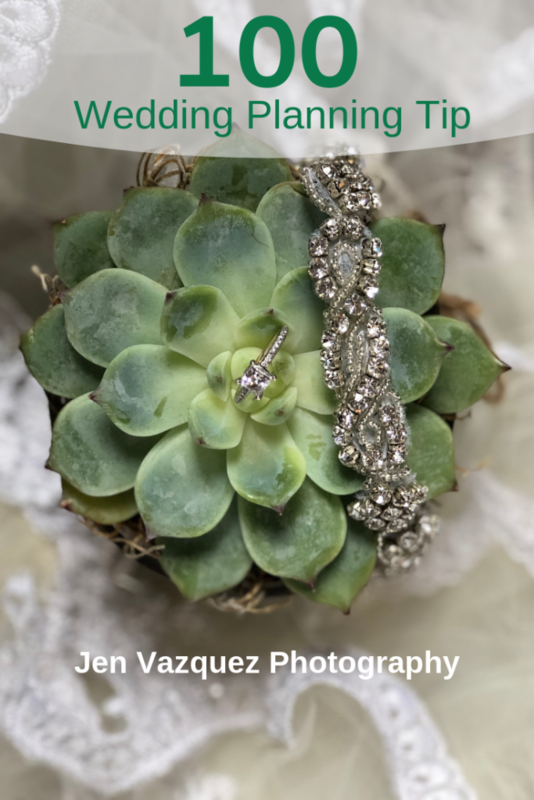 I’ve been a wedding photographer for 10 years and married for 20, so I thought I’d start sharing my 100 tips to wedding planning from engagement through honeymoon. After getting engaged, don’t make any decisions for at least a few weeks. Just take that time and enjoy your news and brainstorm. Before deciding upon venue or dress, choose the “feeling” of the wedding so you can narrow down to a theme/color. That will help you with all other decisions. Budget is most important before you choose anything else. If parents are helping or not, budget will decide venue, and date (depending upon how long you need to save). Decide what’s important to you two. Think about weddings or bridal parties you’ve been to. Take what you loved and leave what you don’t. Get inspired by Pinterest, but don’t copy, just let it inspire you. Be prepared for everyone’s opinions. They feel free to share. Be gracious, but let them know that you’ll add that to the list of advice you’re getting and that you and your groom will be deciding on what’s best for you two. For inspiration on how to make your wedding especially you two, consider what you two have in common or love. Do you love the beach or the forest, have a common passion, love the same color or are you two casual or elegant? Picking a wedding photographer is important. Make sure you click with their personality. Picking the right photographer will help you to remember your wedding for years to come. Decide upon a venue by looking at the city that makes sense, then the number of people it holds for your budget, then the decor. You can always decorate it to your style. When planning your wedding, think about the best weddings and parties you’ve been to and why they worked so well. This will help you prioritize what’s important to you, whether it is loads of dancing time and great food like me, a romantic church ceremony or guaranteed sunshine if you marry in a warm place like Greece. This helps you to decide upon the style of the wedding. Self-Care is essential to relaxed planning and a beautiful wedding day. Schedule regular appointments to dedicate to self-care. This will look diferent depending upon what you need. They can include veg-days, massages, using your favorite body cream nightly, reality tv (I always find watching other people’s drama, enables me to realize my stress isn’t so bad), a long bath or shower, exfoliate top-to-toe, doin face mask sundays, a glass of wine/champagne, or a good mani/pedi. If it’s good for the soul, for the mind, for your skin and for your relationship with your fiancé, then block time in your week to do it. Start a scrapbook either on paper, in an album or on pinterest. Gather all the things that you want people going to your wedding to “feel”. Anything that inspires you. it’s a great way to create a visual idea of your wedding. Don’t worry if nothing matches to begin with, because eventually a pattern will emerge and you’ll figure out your style. Also, add pictures of wedding planning and you can have a lovely keepsake of wedding planning too. Look around your own home inspiration – mementoes of your relationship will create a fun, relaxed atmosphere at your reception. Bachelorette parties are all about celebrating your last single days with your closest girlfriends, but don’t make bad decisions right before you get married. Alternatives to vegas and other crazy time? Tea party, wine tasting, spa day, rent a beach house for the weekend, do a scavenger hunt, camping, old school sleepover, have a wear your old bridesmaid dress party, go to an amusement park, have a glam photo shoot with your crew, escape room, visit a museum, pole dancing class, take a cooking class, bungee jumping or skydiving, learn to make cocktails class, going to a vacation destination. Making your guest list is very stressful, but it doesn’t have to be. I recommend starting with listing everyone you think you want. Now take off anyone you haven’t seen in a year and is not family. Now you’ll have a paired down list and you can (depending upon your budget) add back people as you want. Don’t forget mom and dad will want certain people invited. If you have a tight budget, it’s best to give each parent a number they can invite. Then both sides parent’s won’t feel slighted. If mom or dad want more people, and you are paying for the wedding, they can pay the cost per person to attend your wedding in your wedding budget. If the person is important to them, they’ll help kick in or change their perspective. As a wedding photographer (and someone who’s been married more than 20 years), I’m in a position to hear and know that these tips are super helpful and so true. But you can make that decision for yourself! Enjoy the tips and if you have another tip that you think is good, please comment below. I’d love to add to my collection. Congratulations on getting engaged!! I’d love the opportunity to work with you, contact me by clicking below.